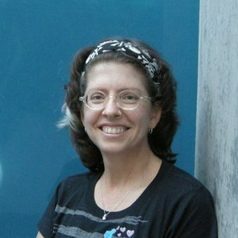 Cora Lynn Deibler received a BFA in Communication Design from Kutztown University in 1985, and an MFA in Illustration from Syracuse University as a University Fellow in 1995. Deibler served the Department of Art and Art History as the Area Coordinator for Illustration from 1997 until 2015. Additionally, she served as the Associate Department Head from 2002 to 2010 and as Department Head, ad interim, from 2015 until 2018. In spring 2004 she received the University’s Advisor of the Year award, and was nominated in 2005 for the National Society of Collegiate Scholars’ Faculty of the Year award. She is a member of the Society of Illustrators, the Society of Children’s Book Writers and Illustrators, and Phi Kappa Phi. She participates in shows at the Society of Illustrators Museum of American Illustration in New York City, and served as a long time member of their Educators Symposium Committee. Her work appeared in “Women in Illustration: Contemporary Visions and Voices” and in “Picturing Health,” both at the Norman Rockwell Museum in Stockbridge, MA. She currently serves on the Board of the Low Illustration Committee at the New Britain Museum of American Art and is the past Chair of Communications for the National Council of Arts Administrators.